An additional 25,000 job cuts brings the recent total at HSBC to 30,000. NEW YORK (CNNMoney) -- HSBC announced Monday that it will cut 25,000 more jobs around the world, in addition to the thousands of job cuts already underway, after reporting a surge in profit. 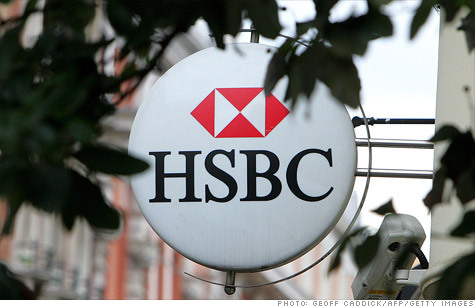 HSBC (HBC) Chief Executive Stuart Gulliver said he expects to cut 25,000 jobs between now and 2013. The company's stock rallied 5% in pre-market trading. This is in addition to the 5,000 job cuts that have been underway since the start of year in the United States, United Kingdom, France, Latin America and the Middle East. The cuts are part of the company's restructuring plan to save from $2.5 billion to $3.5 billion. The banking company also posted increased profit. HSBC reported a net income of $8.9 billion for the first half of the year, up 35% from the first half of 2010. The finance company reported earnings per share of 51 cents in the first half, up 34% from the first half of 2010. HSBC did not specify where the new job cuts would be taking place. But it said it would be selling 195 U.S. branches, principally in western New York, to First Niagara Bank (FNFG). HSBC also said it was closing its retail business in Russia and Poland, and shutting down three insurance businesses. Gulliver said he had a positive outlook toward emerging markets, highlighting China and the Middle East, despite his "clear short-term concerns." "The geopolitical and regulatory backdrop is uncertain and presents challenges for the developed economies," he said. -- CNN's Mishan Afsari contributed to this story.